A new wind farm (or else an extension of an existing wind farm) is going up about five or six miles north of Manson, Iowa. These photos were taken today on-the-go. Nevertheless, they show the massive size of the windmills, especially when compared to the size of the trucks in the second photo. As the first windmills were constructed in northwest Iowa, I thought they were fascinating and beautiful and I liked the concept. Now there are so many that I look forward to the expanses of horizon where no windmills exist. 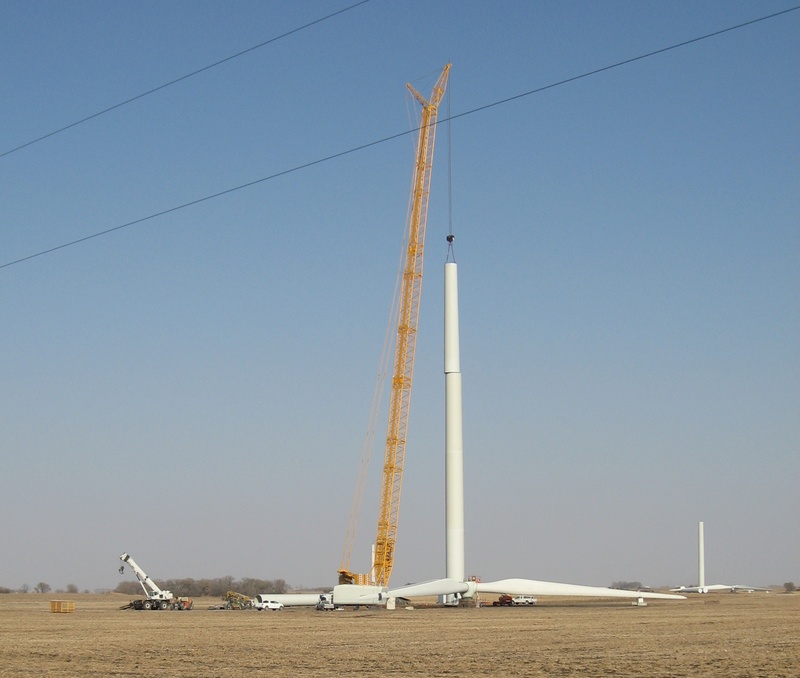 Click here for the “Wind Industry Progress” by Iowa county as of March 31, 2010. Shown below are two separate windmills at different stages of construction. Clicking on the images will enlarge them. Twice enlarges even more. When I look from the road at operating windmills, the blades seem so small and fluid. 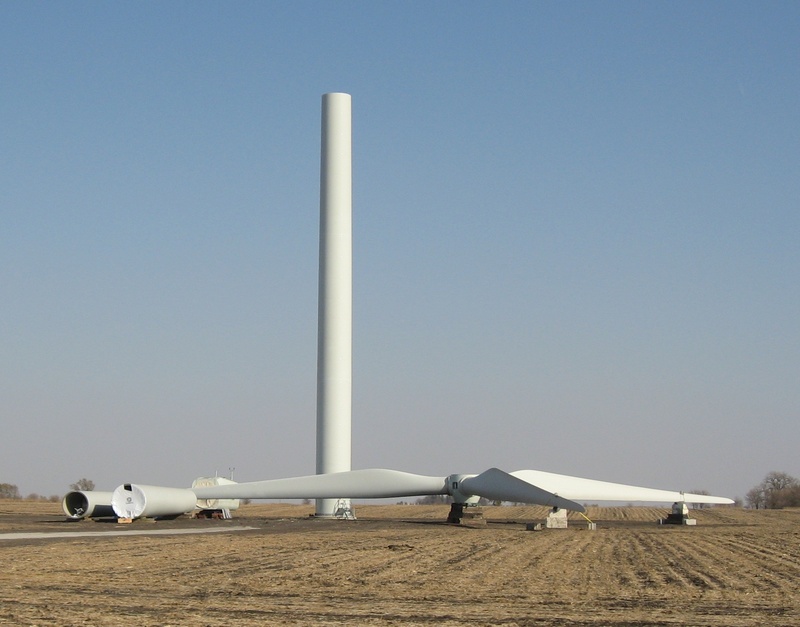 In this second photo, compared to the size of the trucks, the blades look ENORMOUS. On Saturday and Sunday, November 12 and 13, I will be exhibiting originals of Mother’s (Marion Gunderson) watercolors, and selling prints of them at Art On the Prairie in Perry, Iowa. My location will be on the lower level of the Historic Hotel Pattee. Even if you are not interested in prints, if you are at the event, I hope you’ll come to my location. I will be by myself on the lower level (near the bowling alley in the “basement” of the hotel) and really, really, really hope there will be people coming in at least to chat. In addition to about 50 art vendors, there will be musicians, poets and storytellers for youth (of all ages?!). I attended last year as a patron. It really is a classy event to kick off the holiday season. So far over $3,500 (from sales of prints of Mother’s work) has been given to the Rolfe Public Library where Mother worked for 35 years. From now until the event I’ll be posting mostly regarding the Nov. 11, 12 and 13 event. This entry was posted on November 2, 2011 at 7:19 pm and is filed under Uncategorized. You can follow any responses to this entry through the RSS 2.0 feed. You can skip to the end and leave a response. Pinging is currently not allowed. On several trips this fall, we’ve watched the progres as new wind generators have been built north of Pomery, east of HWY 4, mostly north of HWY 7. Although we’ve seen the tall crane, we haven’t observed anything in action. I’d love just to stay and watch one generator being built from the very beginning to the end. I see how the tower is stacked using the crane. I wonder how the rectangular part and the blades are attached. I suppose there are some people up high attaching everything together. Louise, your photos certainly give perspective on the size. You have a very good eye for things that would be of interest to us and for capturing the subject with your lens. Thanks!